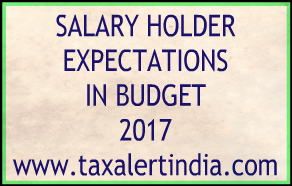 Till financial year 2004-05, a standard deduction to the extent of Rs. 30,000/- was available against salary income. It was withdrawn from assessment year 2006-07. There are various expenses that the employees incur during the course of employment for which there is no deduction available to them. Salaried employees are not allowed deduction of any expenses incurred during the course of the employment. Provisions similar to the standard deduction should be reintroduced. If Government does not want to give this benefit to all, a cap of total salary of Rs. 10 Lacs can be put for availing this. Under section 17(2)(v) of the Act, reimbursement of medical expenses to employee is, chargeable to tax if total amount of medical reimbursements is exceeding Rs. 15,000/- in a year. This limit of Rs. 15,000/- is introduced in the year 1999. Now after 17 years, this exempted amount is same in spite of the double digit inflation. During this period of last 17 years, cost of medical treatments increased in minimum 3-4 fold but this amount of this exemption is intact. In our view, this amount of exemption should be minimum for Rs. 50,000/- per year. For financial year 2016-17, basic limit for not charging of tax if total income is less than Rs. 2.50 Lacs, An additional rebate to the extent of Rs. 5,000/- in tax under section 87A is available if total income does not exceed Rs. 5 Lacs. After demonetization and proposed GST era, Tax slabs need to be revised. Minimum Rs. 4 Lacs should be tax free. As per provisions of section 24 of the Act, in case of self-occupied house property, there is a deduction of interest on loan taken for such property is available, maximum up to Rs. 2 Lacs for a year. In metropolitan cities like Mumbai, Bengaluru, Chennai, etc. cost of apartments are very high. If someone think about independent house, value may go double as compare to price of apartment. In general, if someone buys 2/3 BHK apartment in such cities, minimum cost is not less than Rs. 1 Crore. If ratio of borrowed money and own sources is 3:1 than loan amount would be Rs. 75 Lacs. Yearly interest cost for such loans will be minimum Rs. 6 Lacs. In aforesaid situation, existing limit of Rs. 2 Lacs is too small. In view of current market scenario and for growth of real estate industry, this limit of Rs. 2 Lacs should be increased to Rs. 4 Lacs. In year 1997, an exemption was provided for children education of Rs. 100/- per month per child for maximum for 2 children. This small amount is nowhere serve the purpose of this allowance. In today's era, what is worth of Rs. 100/-? Nothing. People having income from salary, have expressed their views that either this exemption should remove or increase the limit to minimum Rs. 2,000/- per month per child. Again in the year 1997, this provision was introduced that if any child of employee is studying and residing in hostel, then to the extent of Rs. 300/- per month per child is exempt under section 10(14(ii) read with Rule 2BB. This is available to maximum 2 children. After 20 years, value of this Rs. 300/- stands no value at all. In the time of high cost of living specially at metropolitan cities, this childish amount of Rs. 300/- is not at all laudable or favorable allowance. Expected from Government, either this exemption shall go away or it should be minimum Rs. 3,000/- per child per month. As of now, only four cities are covered under the definition of metropolitan cities, i.e., Mumbai, Delhi, Kolkata and Chennai. Purpose of this definition is getting higher benefits under the heading of House Rent Allowance (HRA), i.e. 50% instead of general rate of 40%. Presently, rental charges for housing in cities like Bengaluru or Hyderabad is more than Delhi or Kolkata. Geographical areas of many cities in country has increased in many folds and accordingly rental charges also increased. In our view, there is urgent need of inclusion of many other cities in this category like, Bengaluru, Hyderabad, Pune, Ahmedabad, Jaipur, Noida, Gurgaon, etc. There are many other areas where salary class is eying for some amendment or relief. We tried to high light main areas as mentioned above, where immediate attention required. In case of other class of taxpayers like business or profession, somehow they can avail more benefits rather than the category of which we mentioned above. A salaried person pays income tax each month. No other category of tax payer - company or self-employed or businessman - is required to pay advance tax each month. Round the circle views are expressed that rate of service tax is going to increase to 18% in upcoming budget, in line with the proposed rate in GST. In consequence, ordinary man mainly salary class people will suffer more due to increased rate of service tax. At least Government should compensate to tax payers under this category by way of some relief through aforesaid provisions in Direct Taxes.